An alternative to traditional long term care insurance. Are you looking for a way to leverage your investments to include protection from the risk of expensive long term care? Do you have an existing annuity that is not needed for income? Have you been turned down (declined) for long term care insurance or does you health prevent you from applying for long term care insurance? If you answered yes to any above question may want to consider an alternative to spending down your own nest egg to pay for long term care. There are different types of annuities with long term care benefits. The most popular designed to cover long term care expenses are single premium fixed deferred annuities with a long term care rider. These are not variable (high risk) annuities. They are more like an open-ended CD. These annuities will provide you with access to long term care benefits, including in-home care. One type of annuity you must buy before your need care (deferred), another type you can buy after you need care (immediate/income) or if you cannot pass long term care health underwriting. If you have an existing annuity or whole or universal life insurance policy (not term) you can transfer money to an new annuity with long term care benefits without paying capital gains tax. See Pension Protection Act. Q: What kind of leverage should I expect? A: Plans and options can vary. Example: male 65, female 61, both average health, $100,000 premium will provide LTC benefits approximateyl of $250,000. Q: What has changed since the Pension Protection Act? Q: But aren't annuities risky? 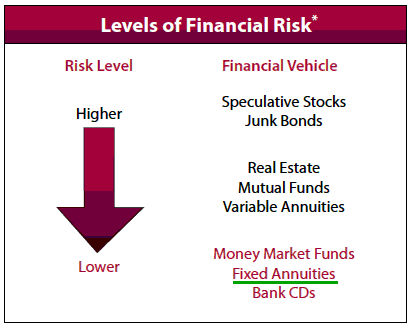 A: Not fixed annuities, they are similar to your bank's CDs, and no one has lost money on a fixed annuity. In fact they may pay a higher rate than your CD and Money Market account. A: Most clients simply reposition money from an existing CD, Money Market, Existing Annuity or Life Policy or from Savings. Q: What happens to the annuity? A: It just keeps growing based on the interest rate of that specific annuity. If you should die at any time the annuity money (less any withdraws) goes to your beneficiaries. Q: Can I use my IRA money or one of my old 401k's to fund the annuity? A: For ages over 59 1/2. Underwriting required. If available in your state, you can do a 1035 exchange or "trustee to trustee transfer" to reposition the money to fund the annuity from a 401k/IRA account. Also spouses can share benefits with one spouses qualified money even if one spouse is under 59 1/2. Q: I have an existing annuity can I do a 1035 exchange? A: Yes, it would be simply a rollover to a secure account that has the long term care rider. Q: Can the owner of the annuity and the annuitant be a different person? A: Yes, in fact boomers are buying this for their parents who are either uninsurable or long term care insurance is just too expensive because of their parents age. Q: How much is the long term care benefit? A: It depends on the type of annuity, whether it has underwriting, how much you put in the annuity and your age when you start the annuity. Q: Is this available to anyone, everywhere? A: The rider is available for those who have not needed or received care service within one year prior to the starting date. Not all products are available in all states. Check with us about current state and age availability. Q: How do I find out if this is right for me? A: Thousands of Americans just like you have decided to protect their nest egg and have long term care benefits with our annuity. Call us, email us or fill out our online form and one of our licensed specialists will answer all your questions. Notice: Variable Annuities with a Nursing Home Waiver. Many of these are sold with the idea that someone can access their money penalty-free if you need long term care, but be aware of what is required to qualify, it may only be used for nursing home and not for home care or assisted living.